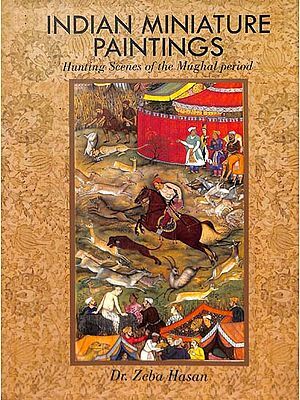 The History of Indian painting from the earliest times to the present day is a fascinating chronicle, though too vast a subject to convenietly compressed into a few pages. 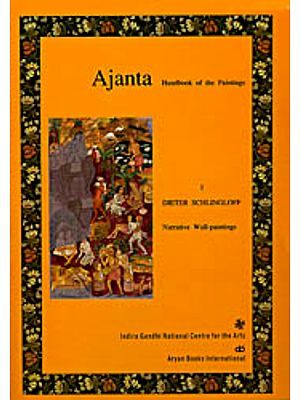 Aware fully of this limitation, the author has narrated as comprehensively as possible the continuous story of Indian painting through the ages. Padma Bhushan C.Sivaramamurti, Honorary Fellow of the Royal Asiatic Society of Great Britain and Ireland, was a sculptor, artist and scholar with a brilliant academic career. He was Curator for Archaeology in Madras and Superintendent, Archaeology Section, Indian Museum, Calcutta. He retired as Director, National Museum, New Delhi. 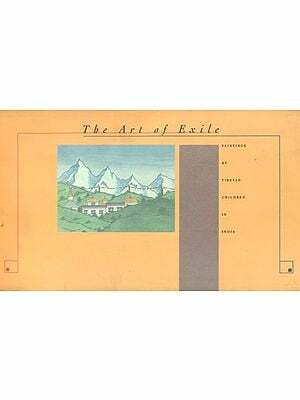 Therafter, he was Honorary Advisor to the Government of India on Muselogy and was chairman of the Art Purchase Committee, and held these posts till his demise in 1983. He served on the Executive Committee of the International Council of Museums, Paris and was Chairman of the Indian National Committee of the Council. Among his important works are Nataraja in Art, Thought and Literature, Amaravati Sculptures in the Madras Museum, South Indian Painting, South Indian Bronzes, Borobudur ( French),L'Art en Inde (first published in French, subsequently brought out in German, English, Italian and Spanish), Indian Sculpture, some aspects of indian culture, 5000 years of Indian Art, and lastly Panorama of Jain Art. He was honoured with a number of awards during his lifetime, and in view of his contribution to Oriental Research, in 1981, the Asiatic Society of Bombay posthumously awarded a special Campbell Memorial Gold Medal. This book owes its origin to an invitation from the Director-General of Archaeology in India to write on 'Indian Painting' in the Relics of the Past series to be published during the celebration of the centenary of the Department of Archaeology. The publication of this, however, was delayed indefinitely when finally it was decided that it should be brought out by the National Book Trust. This fascinating subject is a vast one not easily to be compressed into a few pages. It is only sought here to give the salient features of the various schools and a continuous story of painting in India from the earliest times to the modern period. 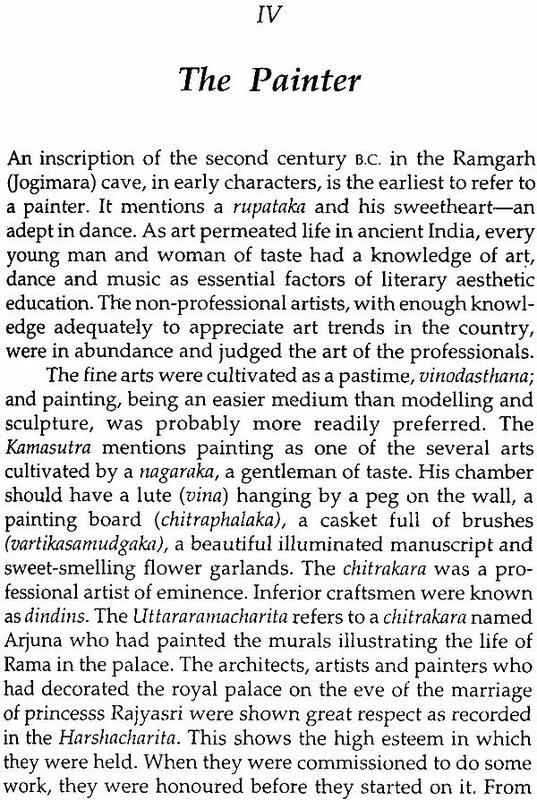 I must here record my indebtedness to the several scholars who have for over a century discovered and interpreted different episodes of Indian painting. For the illustrations and photographs contained in this book, I am indebted to the Department of Archaeology, the National Museum and the Photo Division of the Ministry of Information and Broadcasting. I am thankful to Shri G.S. Bagga for preparing the index. To the National Book Trust and specially to Dr. Keskar who evinced keen interest in the publication of the book, I am grateful for expediting the publication. Moved by the charm of Nature around him, man has expressed his appreciation of it in works of art produced by him. This goes back to a time when he was still a primitive. Art has had a softening influence on him. The earliest paintings of the prehistoric age in the caves all over the world give us magnificent examples of the observant eye and the trained hand even in man's savage state. The colours chosen, the movement portrayed and the expression suffused in the pictures really make us marvel, even if all of them are not of the standard of the paintings at Altamira. The prehistoric cave paintings in India give us a picture of life in those far-off days of the early man in India. 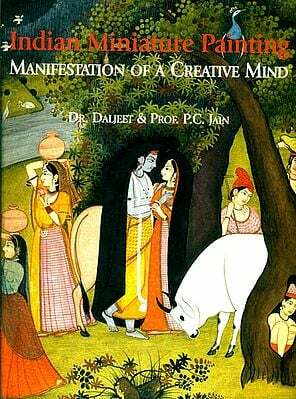 It is a great and true experience that Kalidasa expresses, when he feels that even the happiest man is elated when he sees beautiful things or hears melodious notes. Though music like art deeply stirs the heart, it is the impression of beautiful form on the eye that has an even greater effect. While in Chinese art, the delineation is as the eye sees, in Indian art, it is both as the eye perceives and as the touch feels. The depth of the figure is thus indicated. The pictures in India show an attempt at modeling. This is corroborated by the fact that the concept of portrayal at its best in India is in terms of the figure in the round, styled chitra. The figure in relief, high or low, is ardhachitra; and the painting resembling sculpture is chitrabhasa. The term chitrabhasa itself indicates that the aim is to portray some kind of modeling to suggest depth. We may here appropriately recall the remark of Kalidasa, through the mouth of Dushyanta, skhalativa me drishtir nimnonnateshu, my eyes seem to roam over depths and elevations, meaning thereby the modelling of the body portrayed in the picture. 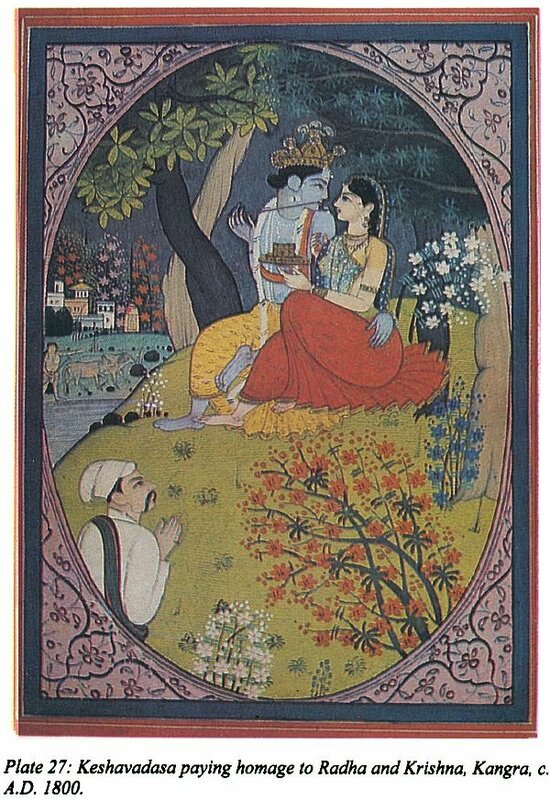 In the six limbs of painting or shadanga, modelling is given as an important one; others are variety of form rupabheda, proportion pramana, bhava-yojana or the infusion of emotions, lavanya yojana creation of lustre and iridescence, sadrisya portrayal of likeness, varnikabhanga colour mixing to produce the effect of modelling. The Vishnudharmottara further elucidates the process, and the strong points in painting are narrated. The line sketch, the most important, firmly and gracefully drawn, is considered the highest achievement by the masters rekham prasamsantyacharyah; there are others who consider shading and depiction of modelling as the best vartanam apare jaguh; feminine taste appreciates decoration in art striyo bhushanam inchhanti; but the common taste is for the splendour and glory of colour varnadhyam itare janah. 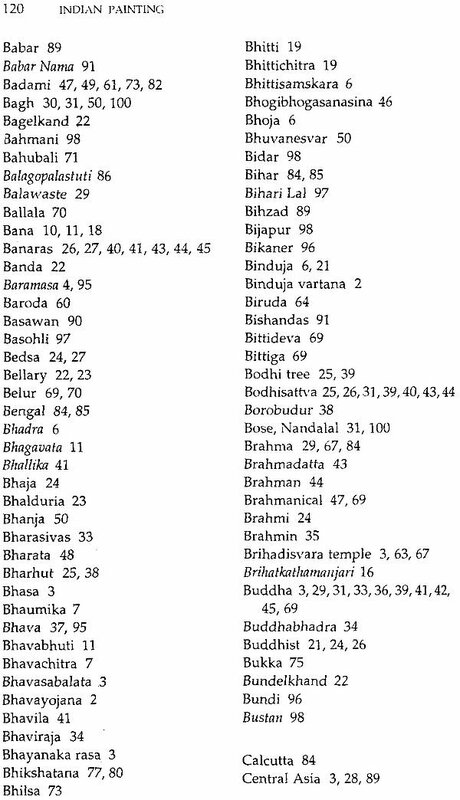 This vartana or shading is of three kinds-bindujavartana, patravartana and raikhikavartana. The first is stippling, the second crosshatching and the third fine line-shading silver points. 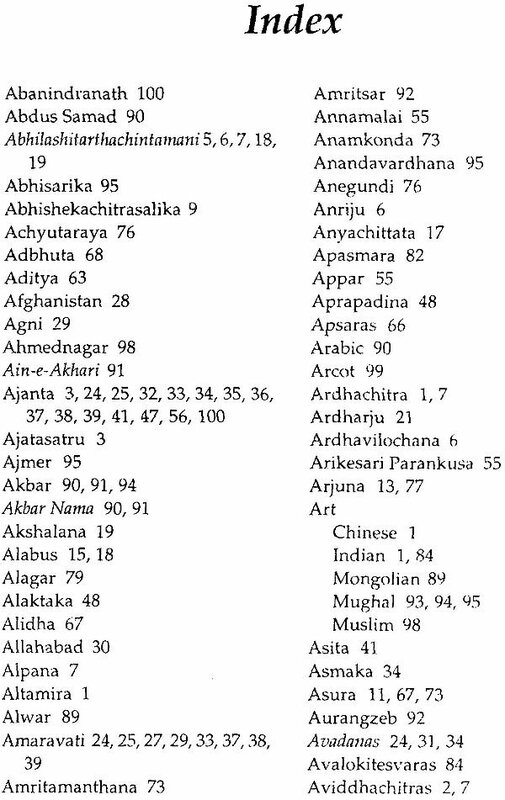 The best picture was with the minimum of drawing, api laghu likhiteyam drisyate purnamurtih, says the Vidushaka in the Viddhasalabhanjika as such figures suggest their full form. This is the greatness of powerful line drawing. Immoderate decoration and loud colouring were almost reckoned a blemish. 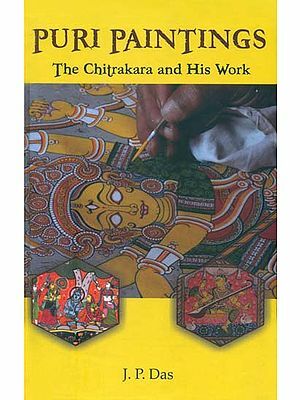 In enumerating chitragunas and chitradoshas, i.e., merits and defects in paintings, an excess of any was considered a blemish. The very classification of pictures like viddhachitras and aviddhachitras, i.e., portraits and studies from life in general, reveals a special effort to produce faithful portraits. There are many instances of portraits. The famous painting from Central Asia, depicting the gentle mode of breaking the news of the Master's passing away to Ajatasatru, with the aid of a chitrapata, or painting scroll, with several scenes from the Master's life, including the parinirvana of Buddha, shows how early such paintings were in vogue. In the Dutavakya of Bhasa, a painting of Dussasana molesting Draupadi in the court is presented and unrolled to be seen. 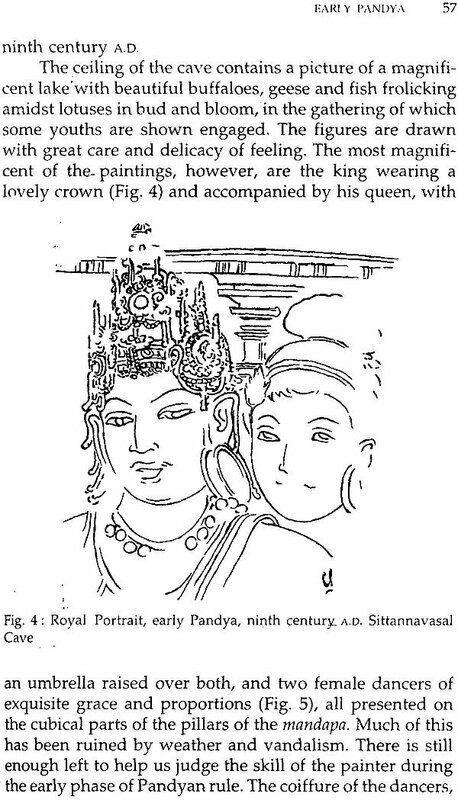 The Pratimanataka describes portraits. It is a portrait that constitutes the theme of the Viddhasalabhanjika. 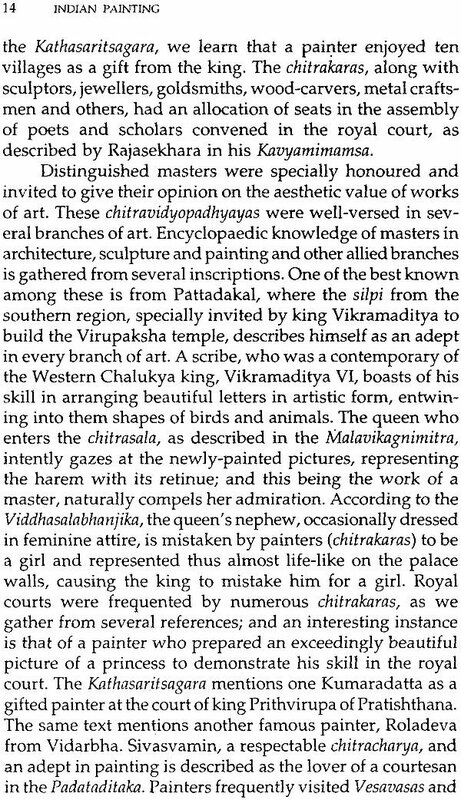 In the Kavyaprakasa, a pathetic verse, depicting the pet parrot in the deserted household of a fallen king, begging painted figures on the walls of the princess and her attendants to feed him, mistaking the pictures for the live ones, suggests the ability of the ancient Indian painter at portrait work. But coming to the historic period, we have several portraits both in sculpture and in painting. The paintings of the Pandyan king and queen at Sittannavasal, Rajaraja Chola with his consorts at Tanjavur, Viranna and Virupanna at Lepakshi are telling examples of kings and noblemen responsible for larger portrait murals. Emotion portrayed in pictures is best illustrated in such masterpieces as the mother and child before Buddha or the subjugation of Nalagiri from Ajanta. The form effectively presents karunarasa, while the latter shows first bhayanaka rasa in the stampede of the elephant Nalagiri, and santarasa where the furious animal lies humble at the feet of the Master. Bhavasabalata or the commingling of emotions is portrayed in such paintings as the host of demons desperately fighting with Tripurantaka, portrayed in the Brihadisvara temple at Tanjavur, the fierce aspect of the rakshakas determined to fight and win or die, contrasted by the tearful wives, clinging to them, dissuading them from fighting an impossible opponent, is an instance of bhavasabalata or the commingling of more than one emotion here, raudra, karuna and sringara. 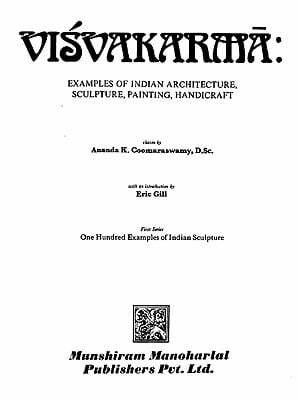 The Vishnudharmottara has specially stressed suggestion as an important element in art. 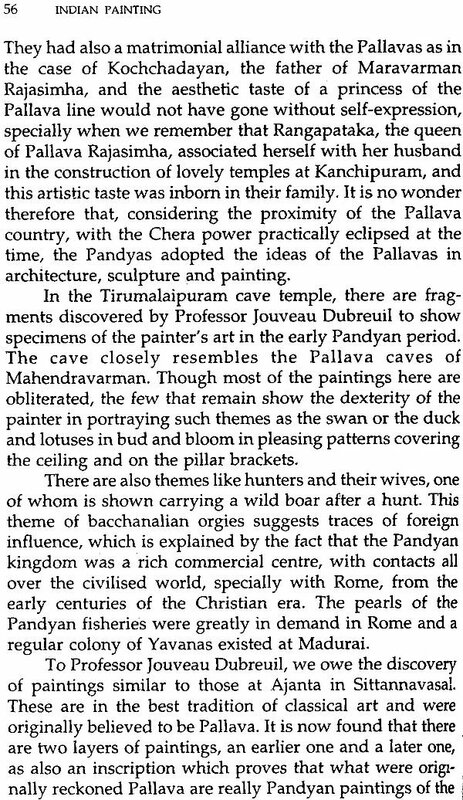 Different methods for suggesting various aspects of nature are here enumerated; as for instance, portraying lotuses in bloom, rishis hurrying for a bath and so forth to suggest daybreak prowling thieves, amorous damsels going to the place of their tryst and so on for indicating night, lotuses and aquatic beings for the suggestion of water, overcast clouds and white cranes flying in the sky to signify the rainy season, pleasant flower-decked forests and gardens to recall spring, travelers oppressed by heat and greatly fatigued to suggest summer and so on. 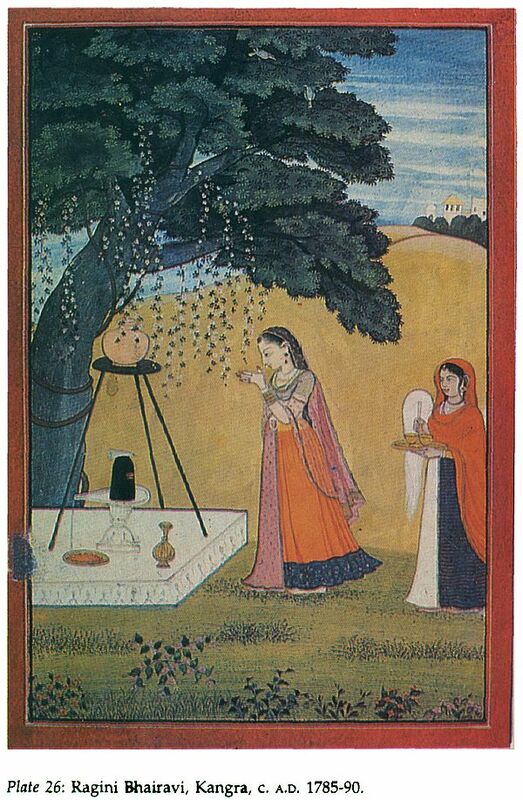 All these devices are carefully followed in paintings and are to be understood in order to fully appreciate the meaning of a picture, specially in the later-day miniature paintings from Rajasthan, baramasa paintings and those portraying the loves of the nayakas and nayikas, in scenes of tryst with sukla or Krishna abhisarika, utkantha and viraha, an overcast cloudy sky or the moonlit night when the pang of separation has its utmost poignancy which is all in the most suggestive language of the brush.